A Little Maintenance Will Save You Time & Money Next Spring! Winterizing your lawn mower is an annual ritual symbolizing the end of the summer. After cutting the grass and mulching all of the fallen leaves for the last time of the season, take a few minutes to winterize your lawn mower. 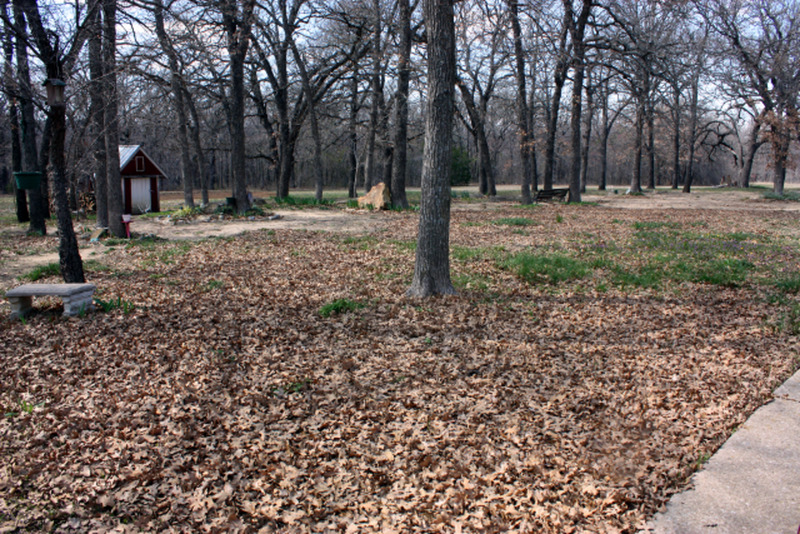 Spending a little time now will save aggravation and money next spring, and your lawn mower will be ready to go as soon as the weather warms up and the grass starts growing again. Winterizing a lawn mower is a simple process that only takes a few minutes and best of all, you don't need to be a mechanic or have a toolbox full of expensive tools. There are two schools of thought when it comes to winterizing a small motor. One common practice is to drain the fuel tank and then run the motor until it completely runs out of gas and won't start up again. Another practice is to treat the gasoline with an additive to extend the life of the fuel and to prevent the gas for evaporating into a varnish or sludge that gums up the floats and needles in the carburetor. I prefer to treat the fuel, and store the mower with a full tank of fresh gas. Running the mower engine dry of gas still leaves some moisture in the fuel system that can cause corrosion or gum up the carburetor. The changing temperatures can also cause condensation inside the closed gas tank, and this can lead to starting problems in the spring. 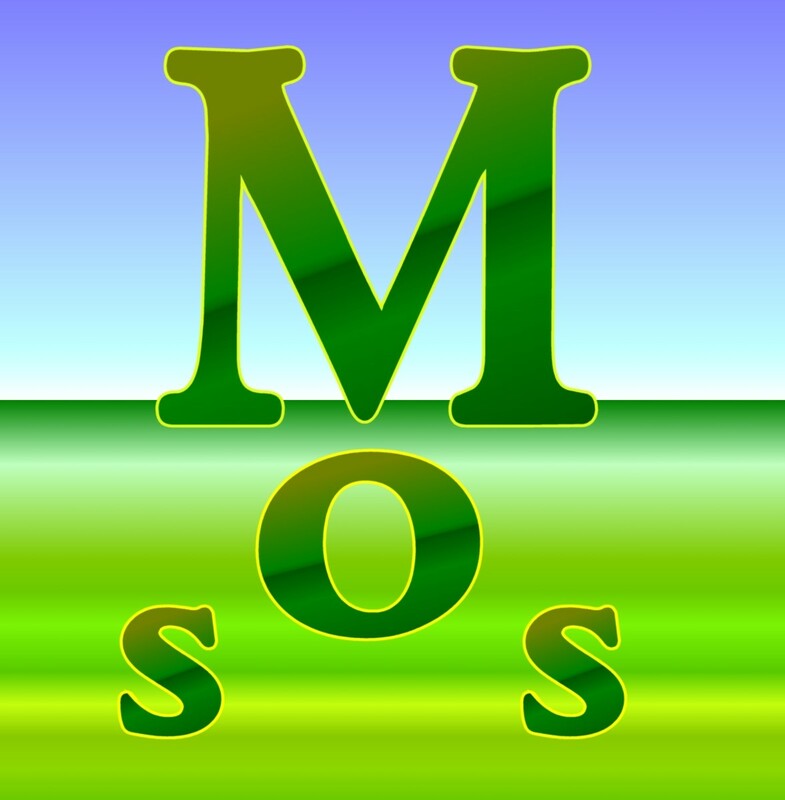 Start by mixing a fuel additive to the gas. There are several brands of fuel additives that extend to life of gas (especially if the petrol contains ethanol). Fill up the mower's gas tank with the stabilized fuel mixture, then start the mower and let the engine run for at least ten minutes. The goal is for the gasoline with the fuel additive to circulate throughout the motor's carburetor and fuel line, protecting the engine components from stale fuel. Top off the gas tank with a little more of the the stabilized fuel mixture before closing the gas cap. After a long summer of use, fall is a good time to change the oil in the mower motor. 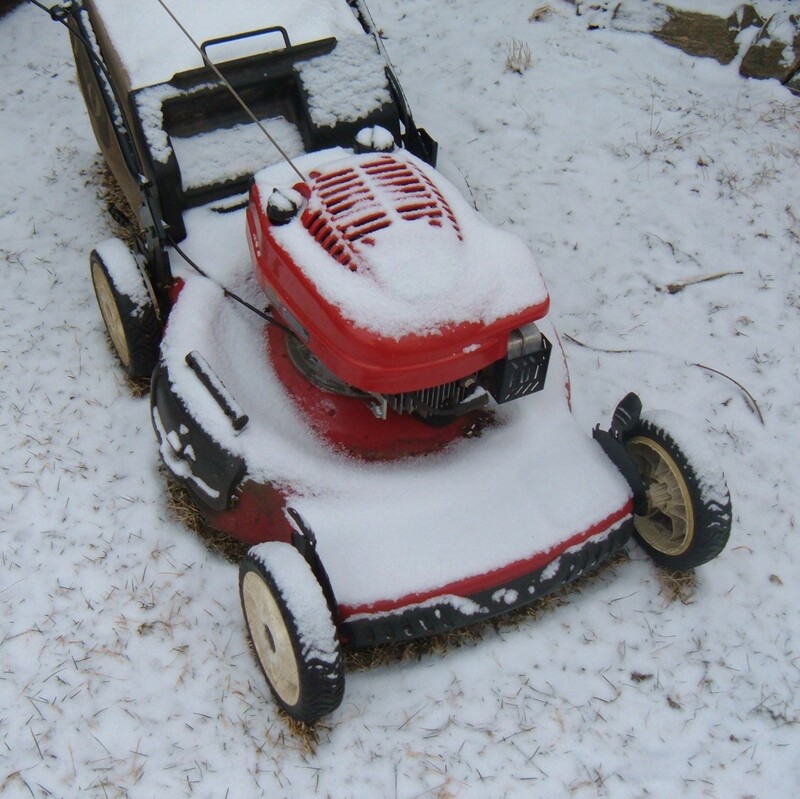 Sure, you could wait until spring to change the oil, but the goal of winterizing your lawn mower properly is to have the mower ready to run when it is needed again in the following spring. Drain the old motor oil, following the manufacturer's instructions. For many lawn mowers, draining the oil is as easy as unscrewing the oil plug (usually clearly marked on the motor), then turning the mower onto its side to let the engine oil pour out. 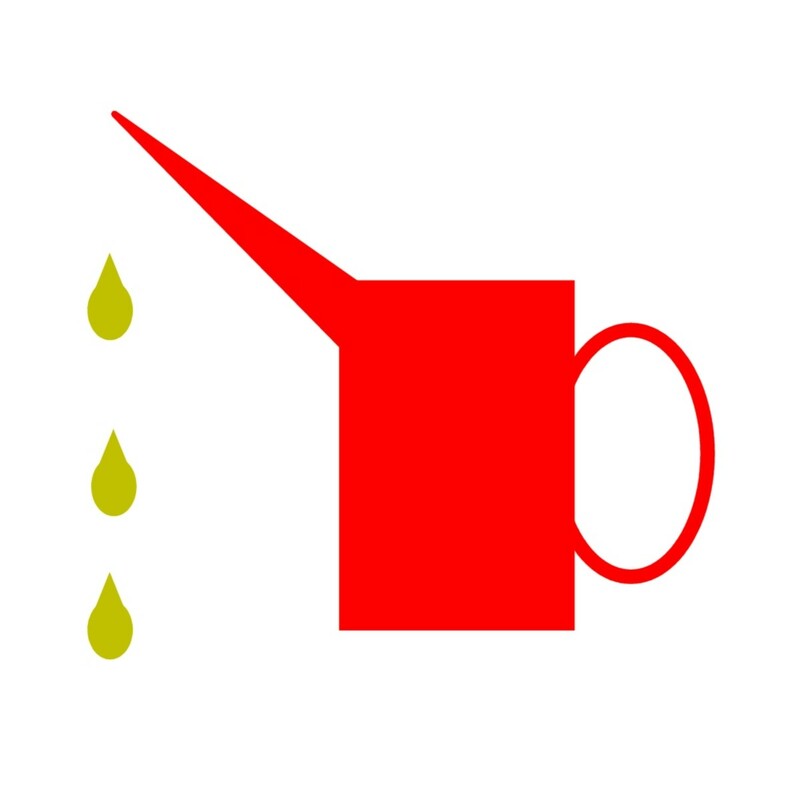 Be sure to capture all of the used motor oil in an old pan or other container, and never let the old oil just spill out onto the ground. Please dispose of the old motor oil properly; many auto parts stores offer free recycling programs for the used oil. Fill the engine with fresh motor oil, again following the manufacturer's instruction for the type of oil to use as well as how much oil to pour in. As an example, the owner's manual for my Toro lawn mower calls for 1-1/4 pints (21 ounces or .62 liters) of SAE 30W grade motor oil. Start the lawn mower and let it run for a minutes to warm up. Then check the dip stick to ensure that you've added the proper amount of motor oil for your specific lawn mower. A clean spark plug is essential for a smooth running engine that starts easily. Check the spark plug by carefully disconnecting the plug wire from the spark plug; a firm yet gentle pull is usually enough to pop the plug wire loose. Then, use a spark plug socket to remove the plug from the motor. 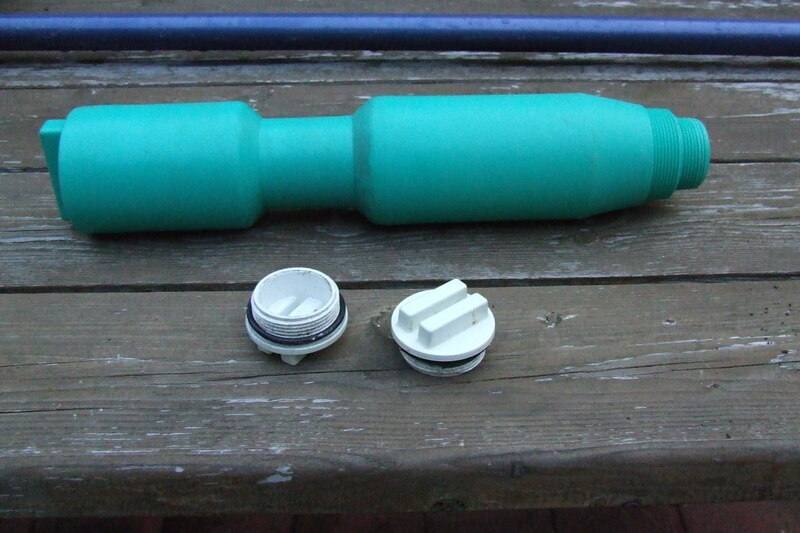 The bottom of the plug will look brownish-black, and the little metal electrode should look evenly worn. If the plug looks fouled or pitted, it's time to replace the plug with a new one. Though a spark plug can last for several seasons, I change the spark plug every year. A new plug costs just a few dollars, and takes just a couple of minutes to replace. I mark and save the old plug as a spare, then take the old plug with me to the auto parts when it's time to buy another spark plug. Having the old plug with you makes it easier to find the right replacement plug, especially if you need to purchase a different brand of spark plug. Carefully screw the spark plug back into the motor. The plug should twist into the motor socket easily without crossing the threads. Then, use the spark plug socket and wrench to firmly seat the plug without over-tightening. Just as a motor needs fresh fuel, it also needs a steady supply of fresh air to run efficiently. Over the course of the summer, the air filter becomes clogged with the trapped dust and debris that it stopped from entering the motor. Cleaning or replacing the air filter is another easy task that takes just of couple of minutes. Depending on the make and model of your lawn mower, the air filter is either a foam insert or a cardboard canister, and is usually enclosed in a small compartment near the carburetor. If in doubt, check your owner's manual for the location of the air filter on your lawn mower. Open the cover and remove the filter. If the filter is visibly dirty, it is probably clogged and restricting the air flow into the engine. Most foam filters can be rinsed in water and replaced. The canister type filters can be tapped against the workbench to clear out most of the debris. Air filters are inexpensive and if they appear old and dirty, simply replace the filter with a new one. 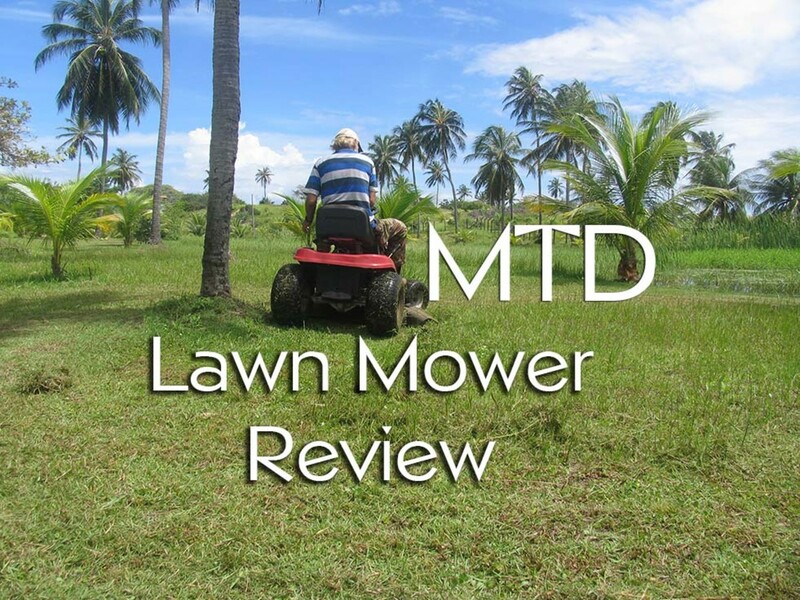 Now that the motor is fully serviced and ready to run, take a few minutes to thoroughly clean the lawn motor deck and controls before putting it away from the winter. Spray off the outside of the mower handle and deck with a garden hose, and use an all-purpose household cleaner to wipe down the exterior, especially the plastic covers and metal surfaces. After the topside of the mower is cleaner, it's time to turn your attention to the underside of the mower and the lawn mower blade. Disconnect the spark plug wire (to avoid any accidental start-ups), tilt the mower on it's side and spray off the underside of the deck with the garden hose. 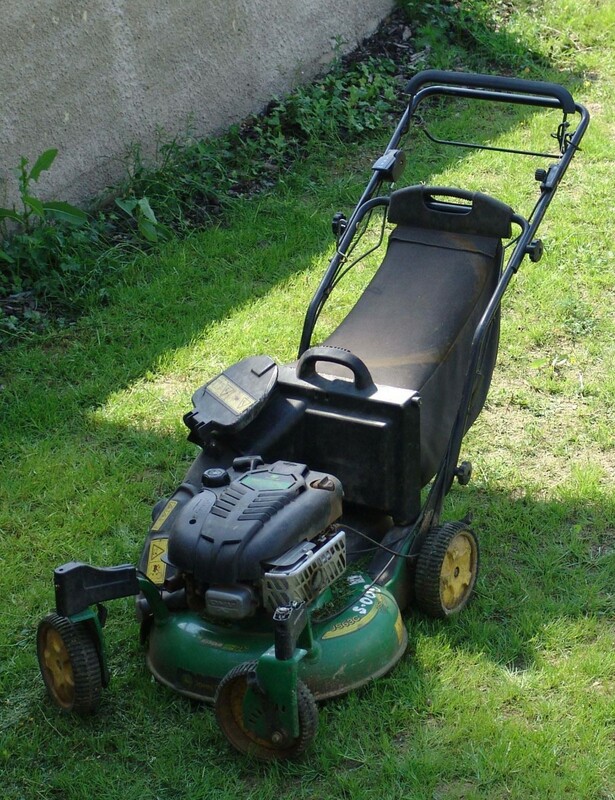 Use a putty knife to scrape out all of the old dead grass that packed up under the mower. While you're under the mower, inspect the lawn mower blade. A sharp lawn mower blade slices through blades of grass for a clean cut and a healthier lawn, and I like to start the mowing season with a clean, sharp mower blade to get the best cut. If the blade is not too badly dinged or bent, get the blade resharpened. Or, you can replace the old blade with a new replacement blade. Most hardware stores and garden centers offering blade sharpening services for just a few bucks, or it is easy to sharpen the blade yourself (see How To Sharpen Lawn Mower Blades). 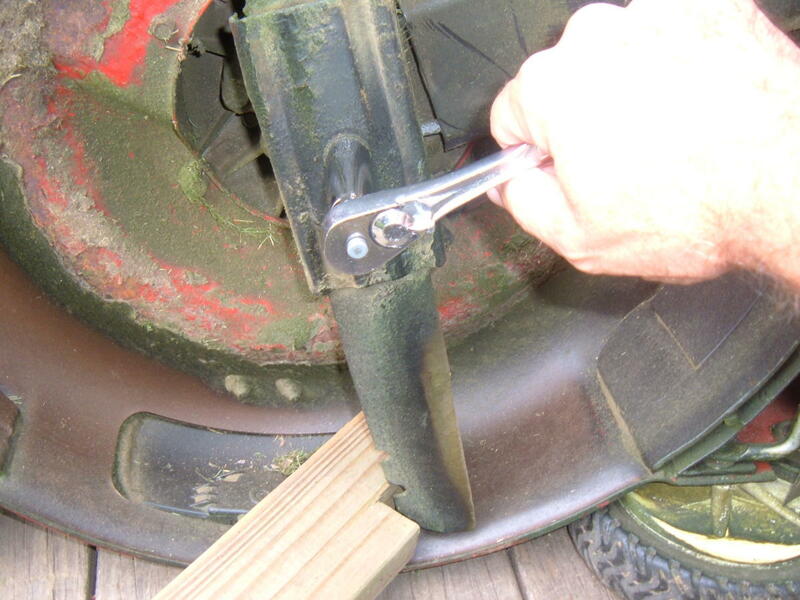 Tip: Buy at least one replacement blade for your mower, and keep it as a spare. When one blade gets dull, swap out the worn blade for the sharpened spare. Then, sharpen the original blade and keep it handy. When the other blade begins to show signs of wear, swap the blades again. Just remember to sharpen the worn blade when you remove it from the mower, and you will always have a sharp replacement blade that's ready for duty. 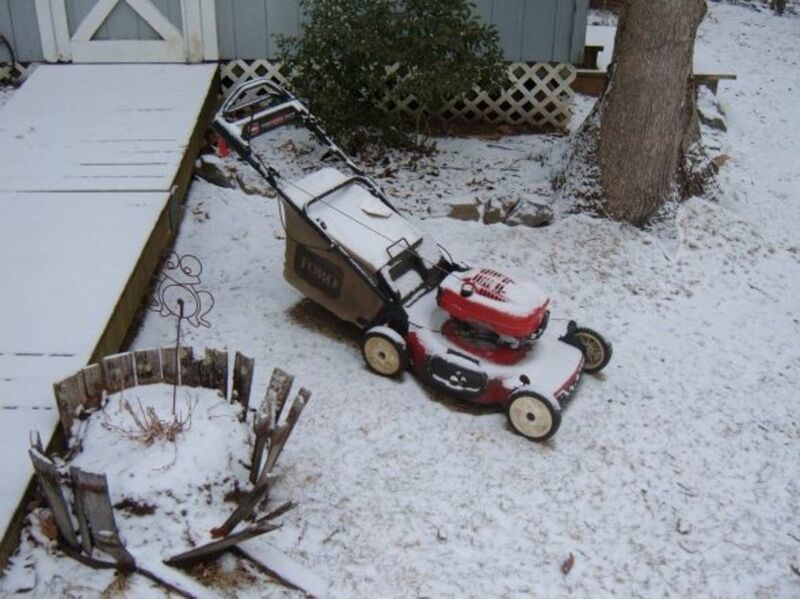 Do You Winterize Your Lawn Mower Every Year? 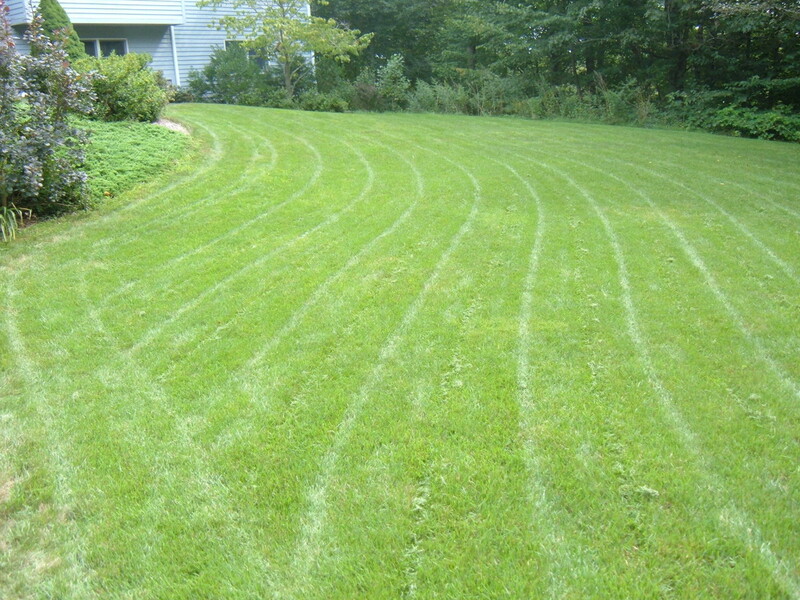 Those few minutes spent winterizing a lawn mower properly will make get starting on spring mowing a breeze. I've seen lawn mowers sitting out in the sno and wonder what people are thinking of, take care of your lawn mower properly and it will take care of you for extended years of life. Nicely done with your point by point details.